Bomb Threats at Community Centers. Reactions to the Muslim ban. Dozens of Jewish Community Centers (JCCs) in 27 U.S. states and one Canadian province received a total of almost 70 bomb threats between 2017-JAN-01 and FEB-21. 2 That is an average of almost two telephoned threats during each working day. "America is a nation built on the principle of religious tolerance. We must protect our houses of worship & religious centers." "The anti-Semitic threats targeting our Jewish community and community centers are horrible, and are painful, and a very sad reminder of the work that still must be done to root out hate and prejudice and evil." "I've been in the business for 20-plus years, and this is unprecedented. 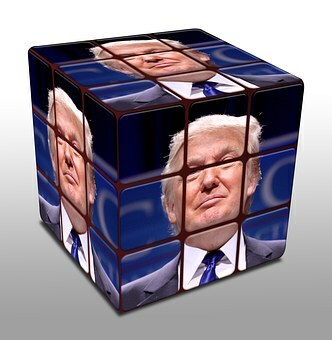 It's more methodical than meets the eye." A new term is being circulated to cover this type of bomb threat. It is being called: "telephone terrorism." 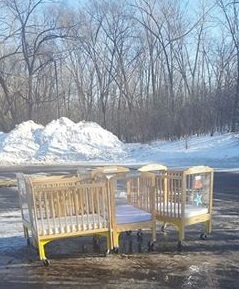 Angie Arnold who works as the Sabes Jewish Community Center in Minneapolis, MN, posted a picture of four empty cribs on Facebook. They had held 18 babies when a bomb threat was received at the Center. The cribs were pushed out of the building and left in the parking lot. The babies were quickly taken to a safe location. "When the staff came back to the building after the all clear, it made my heart stop to see these cribs sitting in the empty parking lot. How do people make threats like this on buildings full of innocent children? I'm praying for our country tonight and our children." #84: "He said: 'We’ve allowed thousands and thousands of people into our country and there was no way to vet those people. There was no documentation. There was no nothing. ... Tens of thousands of people into our country, and we don’t know anything about those people'." In reality, "Refugees to the U.S. are rigorously vetted. The process includes multiple kinds of background and security checks and a minimum of two interviews with U.S. representatives. #85: "He said: 'We’ve got to keep our country safe. You look at what’s happening in Germany, you look at what’s happening last night in Sweden'." In reality there was no security incident in Sweden during the previous night. "The sick and tragic thing is, refugees have been politicized -- in some truly grotesque ways -- by American politicians. Many of our current leaders have used refugees and immigrants as scapegoats, blaming them for our security problems, painting them as the monsters under the bed, and the vague scepters that keep us awake at night. The rise of Nationalist sentiment and xenophobic rhetoric -- palpable in our national discourse lately -- has not emerged in a vacuum. Someone has to play the villain in order for that to happen. And who better to place in that role than the most vulnerable, traumatized, and desperate people in the world? But refugees didn’t create that fearful climate. Politicians did. Refugees are not political. But they have been politicized. They have been politicized and dehumanized, which is a crime against humanity. That narrative of “dangerous strangers from elsewhere” is entirely secular; a narrative that the Church is called to replace with one of peace and compassion. ..."
"It’s time to disentangle those two narratives from each other, and unashamedly answer Jesus’ call to welcome the stranger. ... There is no living above the fray while following Jesus. And that’s not politics -- it’s the gospel truth."